Please welcome author Radhika Maira Tabrez to share her views on ‘Say ‘yes’ to Satire. When one first watches the movie ‘Wag The Dog’, it is easy to shrug it off as a completely outlandish story. And I’m sure a lot of people would have done just that, had it not been for all that happened shortly after the movie was released in 1997. A few months after it came out, the Clinton administration got embroiled in the Monica Lewinsky scandal and shortly after that the Al Shifa Pharmaceutical Company in Sudan was bombed. It all bore an uncanny resemblance to the plot of the movie wherein the President of the U.S. hires a spin doctor (Robert DeNiro) to distract the voters from the fact that he has been accused of sexual misconduct. DeNiro in turn hires a big shot Hollywood producer (Dustin Hoffman) and together they create a fake war on Albania and feed it to the media. The media laps it up. It is a ‘perfect’ war production after all – replete with all the essential elements – a message ‘to bring peace and freedom to a distraught nation’, a hero who is ‘left behind the enemy lines’ when the war ceases abruptly, a theme song ‘to bring the hero home’ and the resultant public show of outrage in the form of ‘leaving shoes hanging from every single tree and lamp post in America’. I remember, I was just out of school, when I first saw it. So I did have my share of disbelief as well over the movie. Of course, I was yet to see and learn a lot. 9/11 was yet to happen and Building No. 7 was yet to go down with all its mysteries. The whole fake war in search of ‘weapons of mass destruction’ was yet to happen too. Like I said, I was yet to see and learn a lot. In the post-Wikileaks and Edward Snowden world that we live in, it is hard not to learn the truth. The truth is out there. Available at the click of a button should we really wish to know it. And once we know the truth, we also learn to see movies like ‘Wag The Dog’ or books like ‘Animal Farm’ or ‘Catch 22’ not just as a piece of art or literature, but as a mirror that the society desperately needs. Because otherwise, we would never know how ugly things have gotten. We sense the power and intensity of the voice that they raise. And how that voice is somehow the only thing, which pushes an otherwise pathologically complacent society, towards a possible change. Wrapped in its saccharine humor and seemingly over the top ironies are the bitter pills we all need. The world is what it is. And it became that way because a majority of us are too bogged down with trying to deal with the rut of a life we are in. In the Bermuda Triangle of bills and taxes, everything else gets sucked in – all that we should be aware of, all that we should be concerned about, all that we should fight for and change. But an artist’s view of the ocean is clear and calm. One can make an argument that that’s because a true artist barely makes enough money to worry about taxes or hardly ever expects to pay the bills on time – so no Bermuda Triangle in his ocean, you see! What the artists see in the reflection of those calm waters is then converted into art which makes the truth more accessible and also in some cases palatable to people. I mean, who would believe that the highest office in the country can pull a stunt like that. But put that truth in a movie and make DeNiro and Hoffman say it instead, and you may have a shot at people buying it. The book Mock, Stock and Quarrel is an attempt just like that. It’s a collection of stories which show the hideous face behind the amply decked up countenance of our society. Of the fault lines which we all know exist, and yet happily ignore until the next big earthquake. These are the stories we all need to read, to know ourselves a little more. And once we do, perhaps even try and change for the better. 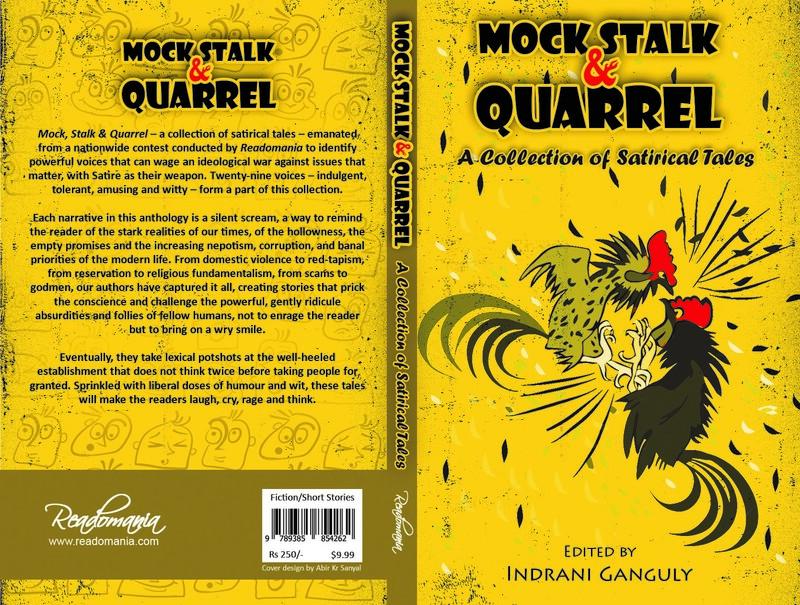 Mock, Stalk & Quarrel – a collection of satirical tales – emanated from a nationwide contest conducted by Readomania to identify powerful voices that could wage an ideological war against issues that matter. Twenty- nine voices – indulgent, tolerant, amusing and witty -for part of this collection. Each narrative in this anthology is a silent scream, a way to remind the reader of the stark realities of our times, of the hollowness, the empty promises and the increasing nepotism, corruption, and banal priorities of the modern life. From domestic violence, to red-tapism, from reservation to religious fundamentalism, from scams to godmen, our authors have captured it all, creating stories that prick the conscience and challenge the powerful, gently ridicule absurdities and follies of fellow humans, not to enrage the reader but to bring on a wry smile. Eventually, they take lexical pot-shots at the well-heeled establishment that does not think twice before taking people for granted. Sprinkled with liberal doses of humour and wit that will make the readers laugh, cry, rage and think. The book is available on Amazon – http://amzn.in/74PIHxP and at leading bookstores across the country. Radhika Maira Tabrez is a hustling mother by day and a writer by night. When she isn’t dancing to the tunes of her four-year-old son Daneyaal, or experimenting in the kitchen for her husband Mujtaba; she loves to read, watch movies, drool on Lonelyplanet.com and engage in DIY home décor projects. 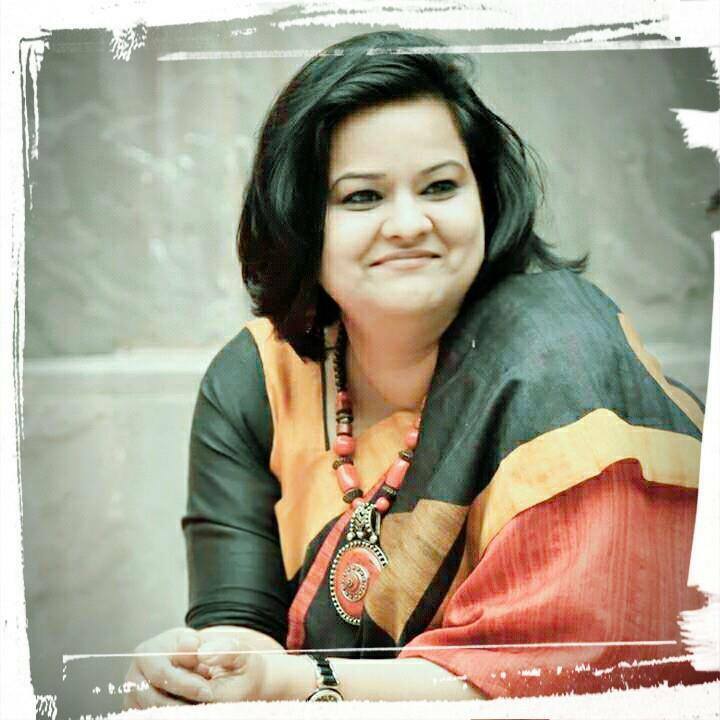 Of all the years she had spent trying to muzzle the writer inside her, two were spent earning an MBA from Symbiosis Institute of Business Management (SIBM), Pune and over twelve in building a career in Learning and Development. Her stories have been features in many anthologies namely: Sankaarak, UnBound, Defiant Dreams and When They Spoke. Her debut novel In The Light Of Darkness (Readomania) was released in August 2016 and has been receiving critical acclaim and rave reviews ever since. She is also an active member of the Kalam Library Project. She was recently awarded the Muse India – Satish Verma Young Writer Award, 2016 for Fiction for her debut novel, In The Light of Darkness.